Rome City Hall is located at 601 Broad Street, Rome, GA 30162; phone: 706-236-4460. Photo: The Major Ridge Home (Chieftains Museum), ca. 1792, 80 Chatillon Road, Rome, GA. This home was declared a National Historic Landmark in 1973. Photographed by User:Cculber007 (own work), 2011, [cc0-by-1.0 (creativecommons.org/publicdomain/zero/1.0/deed.en], via Wikimedia Commons, accessed May, 2013. Rome was founded in 1834 and succeeded Livingston as the county seat the following year. Its name, drawn by lot, was suggested because it was built upon seven hills as was ancient Rome. 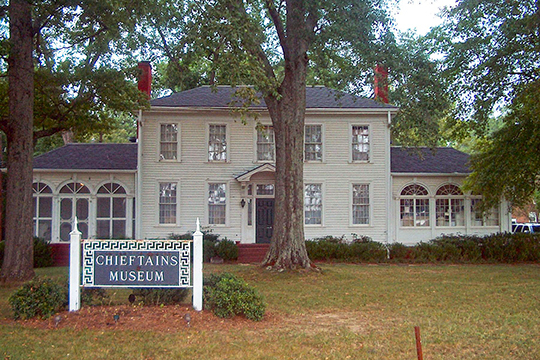 The Cherokee Female Institute, later called the Rome Female College, was founded here in 1853. When Chattanooga, Tennessee was chosen as the terminus of the Western & Atlantic Railroad, the Rome Railroad, chartered as the Memphis Branch Railroad in 1839, was built to connect with the Western & Atlantic at Kingston. Stagecoach lines and post roads were established over Indian trails in north Georgia to join other routes at Athens, Milledgeville, Macon and Augusta. Although the steamboat Coosa came up the river from Greensport, Alabama, and the locally built William Smith was operated for a time, river traffic never flourished. Rome has always been supported almost equally by agriculture and industry. Even in its early days it was a cotton market and had thriving tanneries. In 1855 the Noble family from Pennsylvania established an iron works here, which later made cannon for the Confederacy. The machine lathe that ground these cannon is still in use at the Davis Foundry and Machine Shop. Federal Works Agency, Works Progress Administration, Federal Writers' Program and the Georgia Board of Education, Georgia: A Guide to Its Towns and Countryside, American Guide Series, University of Georgia Press, 1940. Rome, Georgia, en.wikipedia.org, accessed May, 2013.